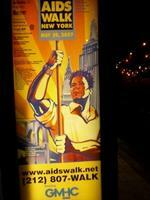 Is it just us, or does this AIDS Walk ad just scream worker's revolution? Everytime we see it, we feel an irresistible compulsion to mobilize. Magnificently magnifying metaphors, this recent All-Bran commercial from Kellogg has no problem touting its ability to aid one in shitting a brick. Or two. Or an entire dump truck load. Yes, the spot is jam packed with endless bowel movement metaphors. Enjoy. - If you care, Facebook's heretofore "non-existent" ad rates have been leaked. - Pepsi's Alan Pottash, the man behind many successful campiagns such as Pepsi Generation, Pepsi Challenge and all those celbu-commercials, died July 27 in LA at the age of 79. - Toto's Times Square bare asses have been covered - quite creatively - following complaints from Reverend Neil Rhodes of the Times Square Church. 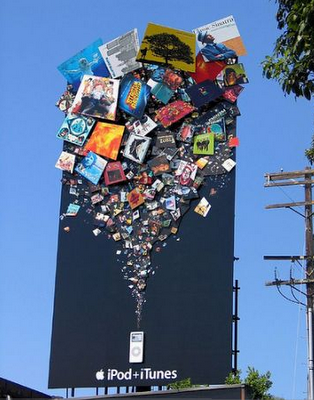 - This is what happens when an ad agency with just ten people and three accounts has too much time on their hands. Here's an ad that's generating a bunch of icky reactions. Rekindling It phobias and sparking court jester jokes, apparently Pepsi will add a little (too much) color to lives that would otherwise fade into grayscale. How in hell did this get past the pitch room? 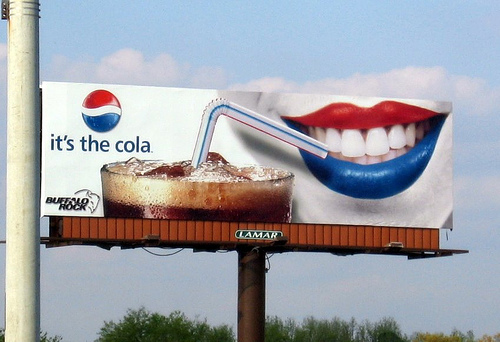 Maybe somebody thought lips in brand-colored trappings would be a natural nod to the distinctive Pepsi logo. And because we know somebody's going to step forward and go, "Hey, guys, obviously it worked because people are talking about it," we're going to roll our eyes in advance and STFU. We got a promising email dubbed "New web 2.0 art project" and arrived at the Art Initials website, a place where you can buy initials in all the combinations you can think of (about 676) and hope some wealthy sap 20 years down the line will go, "By Gad, I've been looking for that AN all over the place! I'll give you a thousand times what you paid for it." The pressie soothingly states you are not obliged to buy your own initials, but popular ones do go for more money. Plus there's a nifty feature where, via Wikipedia, the website tells you what your chosen initials mean in contemporary life. The hope is that by pushing a limited selection of initials, and selling popular ones at a higher rate, a "community" will flourish that outlasts the actual service. We can see that happening. Friendships are made over shared acts of stupidity all the time. Initial art comes in midnight black, navy blue and Kashmir beige. VLAN! 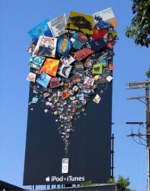 drew our attention to this 3D billboard for the iPod (and iTunes), which is perched somewhere above the streets of New York. We can see a few album covers in our own collection, including Sinatra and Jack Johnson, which definitely gives the ad a double-take quality. Is it just us, or does it look like the wee white device is vomming media? Guess that's apt. With the failure of Jeeves and the new face of Ask, characterized by that cryptic billboard campaign, it took us awhile to warm up to the brand's quirky new personality. The ninja effort probably helped. What we like about the new Ask is that they manage the random humor well but don't go all left-field - all efforts serve the purpose of delivering the same, consistent message in different ways. Smart. Why is that so hard to do? Here's a fun time waster for marketers sick of the daily pitches they receive from agencies. With old school-style gaming technique, you can annihilate those incessant pitches as the enter your office and disturb your day. There's nothing more to it. Well, except for that mini-skirted flight attendant who welcomes you to Moosylvania's world. And yes, it's all just another agency pitch.